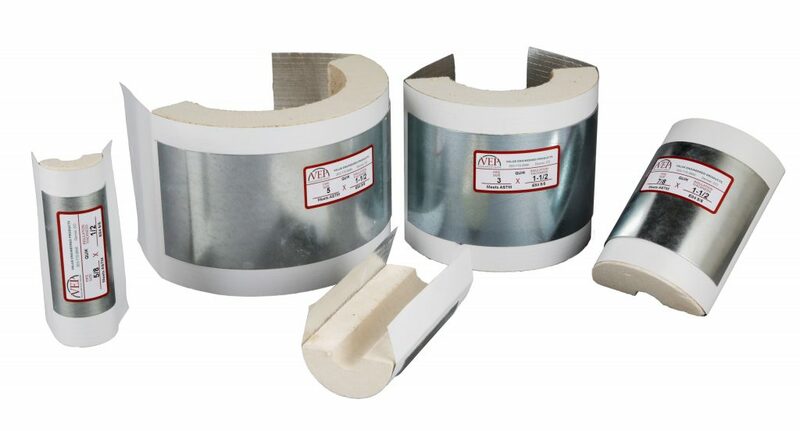 Quik-Shields are economically priced 180o thermal hanger shields providing a continuous section of insulation and factory applied jacketing meeting ASTM E 96A (maximum 0.02 perm) through a variety of pipe hangers. The jacket extends beyond the galvanized steel shield and beyond the insulation insert for a neat, joint with both the adjoining and the field-applied top insulation. To assure proper support in all situations, high density 450 PSI structural inserts are installed on units for 10″ pipe with 1″ wall thickness and on all units for 12″ pipe and larger. Quik-Shilds meet the ASTM E84 Standard Flame Spread -5-, Smoke Developed -5-. For indoor use on flat surfaces, clevis or other band-type hangers. Pipe sizes 16 inch and larger in clevis hangers only. Hanger spans per MSS SP-69 Table 5. Available for pipe 1/2 inch through 24 inches. 100 PSI Calcium silicate meeting ASTM C-533 Type 1, C-585, C-795, E-84, Thermal Conductivity (‘k’) .40 @ 75° mean.